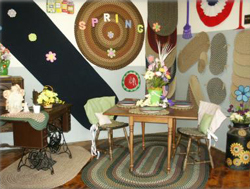 Rhody Rug, Inc. a small family business, was established in 1983. From the very beginning our objective was to build a company that was different. Where most companies have grandiose visions of perpetual and unlimited growth, we at Rhody Rug, Inc. determined that ours would be a future of controlled and limited expansion wherein we could preserve the hand skills so necessary in providing a superior product. We would also offer something too often forgotten today, personal concern and attention to every need of dealer and consumer. These objectives will never be compromised to the temptation of mass production or inferior materials.